It’s springtime and you have a runny nose. You’re sneezing, feeling tired and just unwell. So you wonder: is it a cold or allergies? Or is it a cold and allergies at the same time? You can actually tell the difference between a cold and allergy based on symptoms, despite the similarities between the two. Granted, it’s not always easy just as it’s not always possible to tell them apart from the beginning, but as soon as other symptoms ensue you should be able to know if it’s one or the other, or both. And here is everything you need to know to correctly distinguish between spring allergies and the common cold. 1) Sneezing differences. Although nothing ever applies to everyone, sneezing is an important detail to help you tell a cold and allergy apart. Sneezing in colds is common, but not frequent, nor continual and it’s not triggered by anything. So if you sneeze all of a sudden, without there being dust or pollen or you being outside, then it’s likely a cold. Not to mention it will stop after a couple of days. Sneezing from spring allergies is extremely frequent, much more than with a cold. Sneezing in the morning, especially when you open the window or go outside is a sign of spring allergies. Sneezing in sunlight also indicates a seasonal allergy because allergies cause photosensitivity, a sort of over-responsiveness to light. 2) Cold vs allergies mucus. The common cold causes a productive cough, meaning your nasal passages will produce plenty of mucus which you will expectorate via coughing. As the respiratory infection progresses, the mucus is likely to turn yellow or darker colors, which is an indication of infection. With allergies, mucus is produced in even greater amounts, all the time. But the difference is it’s transparent and extremely liquid, almost watery. Allergy mucus doesn’t change color and will remain transparent or whitish at most. In any case, it will look clear and reasonably healthy. Grey streaks can indicate the presence of dust. Mucus production also tends to increase after being outside in contact with pollen and will continue for the duration of the pollen season. 3) Runny nose vs stuffy nose. It’s possible to have a bit of a runny nose at the beginning of a cold, usually occurring together with sneezing, but both are short-lived. The runny nose is usually not very pronounced and closely followed by nasal congestion as the infection progresses. A runny nose alternating with stuffiness are both characteristic of spring allergies and continual, getting worse after spending time outside in contact with plant pollen or opening the windows to air out your home. 4) Tiredness. The common cold can cause minor aches and pains and a manageable degree of tiredness. While they do not cause aches and pains, allergies can make you feel tired, exhausted even. With allergies you actually feel tired all the time for no reason. Other symptoms that increase the fatigue include extreme sleepiness together with mental confusion and a sort of lethargy or lack of alertness. 5) Headaches. It’s uncommon to experience headaches with a common cold, although not impossible. But headaches together with sinus pressure are extremely common with spring allergies, sometimes occurring on a daily basis. 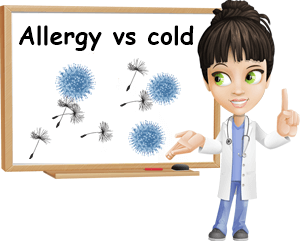 6) Cold vs allergic rhinitis frequency. While it may sound redundant, you have to take into account the fact that the common cold is more frequent during colder months, while allergic rhinitis is frequent in spring, when the weather is warmer as trees and other plants need sunshine and warmth to bloom. – Common cold: cold sensitivity, chills, occasional low-grade fever, sore throat, coughing, lack of appetite, earaches. – Spring allergies: itchy nose, red and itchy eyes, itchy ears, mouth and throat, tingling sensation in throat, skin itching or redness, puffy eyes (more than usual), laryngospasms, sleepiness or insomnia, poor concentration, sinus pressure. By addressing your symptoms and learning which are more common in which situation you can tell if it’s a spring cold or allergies. And if symptoms overlap, consider the fine details such mucus color or what triggers your sneezing. Sometimes it can be both and it’s really not that uncommon, especially if the low temperatures persist well into spring which helps spread cold viruses (see article on The Common Cold: Causes, Symptoms and Treatment). 1) The common cold is caused by a virus. This means a healthy immune system will clear the infection by itself. At most, medication such as pain relievers or nasal decongestants can help minimize symptoms. However, nasal decongestants are best avoided because they easily cause rebound congestion. It helps to stay hydrated and eat well, especially protein and foods rich in vitamin C and zinc. Taking vitamin C and zinc supplements can help strengthen the immune system, reduce common cold frequency and ease symptoms. Resting if necessary is advised. Natural remedies such as herbal teas made from ginger, echinacea, eucalyptus, Rooibos, lemongrass, elderflower, flavored with cinnamon, cloves, lemon juice and sweetened with honey can help with congestion, cough and chest discomfort. However, remember to check for allergies. See all honey varieties. 2) Spring allergies are essentially an excessive immune system response to otherwise harmless pollen particles. Harmless in the sense they do not produce disease. Limiting contact with pollen by staying indoors on windy days, showering and changing clothes as soon as you come home, drinking lots of water and having water and your essential medication with you at all times are strongly advised. Taking vitamin C every day can help as the nutrient is a strong natural antihistamine. With both conditions it’s rather a case for preventive care and symptoms management as there is no cure for either.